Ben Sortino has always bordered himself with football and is certain playing football is where he belongs. Ben’s love for football started at a young age and as years passed by, Ben grew more determined and committed in perfecting his skills, as playing football was simply a perfect fit. Having the support of family is an extremely important aspect in pushing Ben to perform his absolute best, more specifically the support given by his dad. Having a dad that was previously a coach as well as a runner within football, can be somewhat daunting, however, in regards to Ben, the tough love given by his dad pushes him to do his absolute best when playing football. “He’s extremely tough, but he tells me how it is and I need that”. Prior to interviewing Ben I was somewhat intimidated considering his large build, however, throughout the interview it was apparent how sweet Ben really was. Don’t let his sweet demeanor fool you, excelling and perfecting his position, as a ruckman is a role Ben definitely doesn’t take lightly. Ben started playing local footy before transitioning to Western Jets before finally finding home at Coburg. 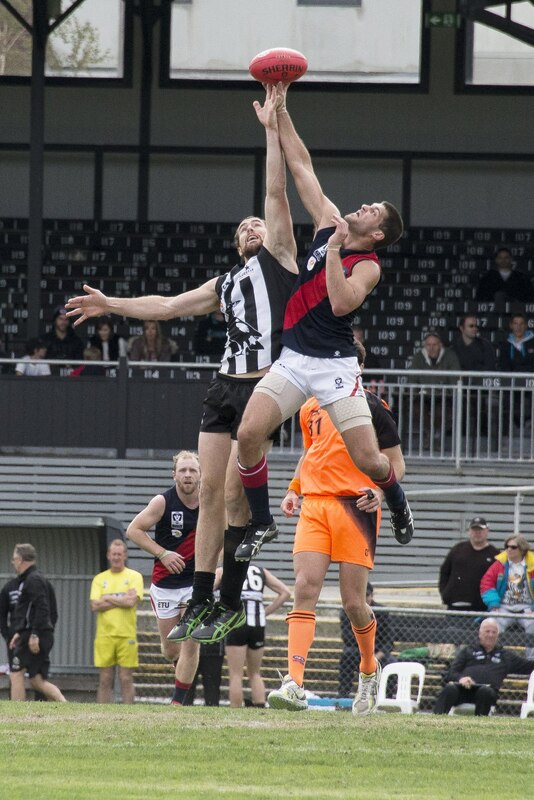 Standing at 192cm his build is a definite advantage when playing as a ruckman, however, hard work and commitment is a necessity if you not only want to play at the highest possible level but more importantly have a positive impact. “Playing my best and doing my best is the most important aspect, If I know I’ve put in 100%, I’m satisfied”. As a young player, the work ethic Ben oozes is admirable, currently studying his Masters in Exercise Science (Strength and Conditioning), working as a personal trainer, the fitness coach for the St Albans Spurs Women’s Football club and playing VFL football is definitely a heavy workload but it’s important, as well as performing to the best of his abilities in all aspects of life “Sport and family, that’s it”. As a player setting a personal goal is important in ensuring growth as a player, Ben aimed to play senior level football to the best of his abilities, one he’s most definitely achieved yet is aware that growing as a player is also an important factor. The benefits of playing for a standalone club is the chances the younger boys are able to grasp; showcase their talents and work towards their future of playing professional football. With that said, proving yourself each week is part of playing football but doesn’t hide the fact waiting is nerve-wracking, nevertheless, having a positive impact for the team is one Ben holds closely as well as ensuring his role within the team is achieved. “When you’re nervous, it’s a good sign. It shows you care”. Like all the players at Coburg, Ben’s certain his found home. The culture, the brand and the overall club is an environment each player takes prides in being apart of. Walking around the clubrooms, you can instantly sense a bond, through the interaction of players and staff; they all have the same aim, to make Coburg Lions a powerhouse club. Playing under the instructions of Germo as well as forming real relationships with the boys will most definitely help Coburg one day be unstoppable. “We’re gelling together really well, each week we take two steps forward, we’re only getting better regardless of where we stand on the ladder”. When you work your hardest to the best you can be it’s admirable, Ben’s main aim is to consistently work his hardest; when you know you’ve worked your hardest, nothing else matters. Ben’s adamant in pushing himself to ensure a career in football is part of his journey.